Months-old internal divisions and ideological disagreements among the 100-member Constituent Assembly – the body tasked with writing Egypt’s new constitution – have reached a crescendo on Sunday as more than 30 non-Islamist members have decided to withdraw from the Assembly’s ranks, accusing representatives of Islamist forces of doing their best to draft a constitution aimed at turning Egypt into a radical Islamist state. The biggest blow to the Assembly came on 17 November when representatives of Egypt’sOrthodox, Catholic and Anglican churches decided to join withdrawals. The Church’s withdrew because the draft constitution clearly puts Egypt on the road of becoming a religious state,” Ghalib toldAhram Online. “This is quite obvious in the fact that under thepressure exerted by the Salafists [ultraconservative Islamists], article 220 was added [to the draft constitution] to offer a radical interpretation of the principles of Islamic Sharia (law),” explained Ghalib. Ghalib argued that article 220 violates the previous consensus under 1971’s constitution that theHigh Constitutional Court (HCC) is the one body exclusively entrusted with interpreting the principles of IslamicSharia. “Islamists reject the moderate interpretations of HCC, aiming to exploit article 220 to introduce radical and medieval interpretations of Islam that can open the way for a religious state and strip Christian Egyptians of their national rights,” added Ghalib. “This is a big dangerous threat against personal freedoms in Egypt and puts the foundation of a Wahhabi-style religious state in Egypt in place,” argued Wahid. “While article 4 states that the selection of the Grand Imam of Al-Azhar will be decided by the law, nobody really knows how this law will be passed, and there are no guarantees that this moderate Islamic institution will not fall under the hegemony of Islamist radicals,” said Abdel-Meguid. Abdel-Meguid said he “urges the two representatives of Al-Azhar – Hassan Al-Shafie and Nasr Wassel – to join hands with churches, by withdrawing from the Assembly. Ghalib, meanwhile, said the Coptic Church is consulting with Al-Azhar hoping to convince it to withdraw its own representatives from the Assembly. 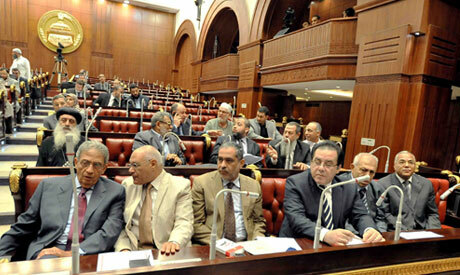 Abdel-Meguid, moreover, argued that the draft constitution strips workers and farmers of their rights including the right of their representatives to occupy 50 per cent of seats in parliament. Abdel-Meguid, who has been the Assembly’s spokesman since its inception last June, was replaced on Sunday by Mohamed El-Sawy, an independent politician with close links to Muslim Brotherhood. El-Sawy said that he would hold a press conference on Monday to respond to attacks leveled against the Assembly. Nour’s statement added that during meetings with Islamist President Mohamed Morsi last week, they urged him to use his powers to give the assembly an additional period of three months until it reaches consensus on the draft constitution. "This is a call for chaos from liberal forces who want to enshrine their secular agenda and non-religious views in Egypt’s constitution,” claimed Makhyoun. “If they finally choose to withdraw then, okay, we also have the option of simply replacing them with substitutes,” warned Makhyoun.